We’ve already heard that VW and Ford have agreed to “investigate collaboration on....electric vehicles,” but now a new report by German newspaper Der Tagesspiegel suggests that VW’s ideas on EV collaboration span well beyond Ford. 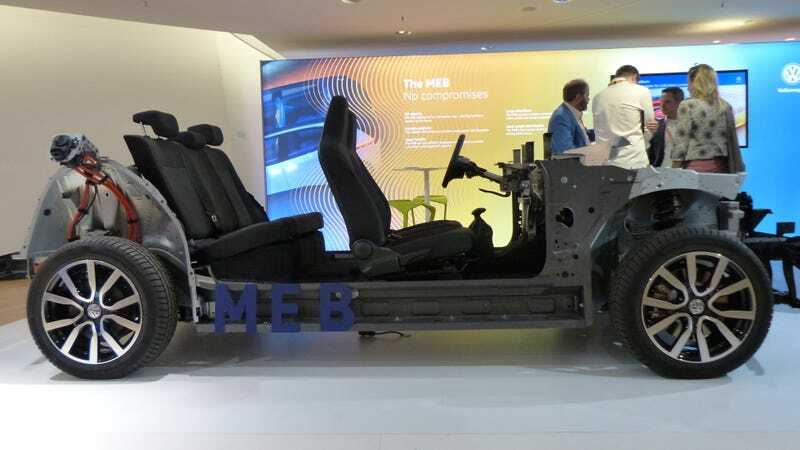 According to the story, VW wants its MEB platform to become an industry standard. Volkswagen has economies of scale down to an art. The company sells a ridiculous number of cars across a bunch of brands, and it’s proven with its MQB platform that it can build many different kinds of vehicles of various shapes and sizes on a single vehicle architecture. The VW Group wants to establish its production platform for electric cars as an industry standard and open for competitors. “Our modular system for electric cars - the modular electrification kit (MEB) - should be a standard not only for the VW Group,” said Michael Jost, head of strategy of the core brand VW, the Tagesspiegel. The Volkswagen Group wanted to open the MEB and offer it to the entire industry. “This is a paradigm shift for us,” Jost told the Tagesspiegel. “We have no elite plan, but a plan for the company.” The car manufacturer is a cost and scalability “champion in the industry.” According to reports, the US company Ford is considering licensing the electrical construction kit. The idea of dozens of cars from various automakers all driving around on VW’s MEB platform may sound wild, but it actually may not be a bad idea for an automaker who doesn’t want to spend billions on its own electric vehicle platform which will, very possibly, have a heck of a lot in common with VW’s MEB. Plus, this strategy could have huge benefits for consumers in terms of overall pricing and easy of vehicle modification and repair. No, this doesn’t mean all the cars will look or perform the same, just that the basic safety structure and suspension hard points, as well as powertrain and drivetrain layouts, would be more or less common. Changes to the battery size, motor output, overall dimensions (wheelbase, track width, cowl length), and sheetmetal could yield all sorts of different vehicle designs. But EV technology is significantly different than conventional car technology, and those differences open up production and sales options that haven’t previously been available. EVs are, to a far greater degree than a conventional car, plug-and-play. They have the potential to be far more modular than cars are now, and that opens up many new options. I’ve reached out to VW to learn more. I’m specifically interested in learning what “open for competitors” means. Would VW build the platform and license it out to others? And who are these companies with whom VW is allegedly in “advanced discussions”? This is an exciting idea—one that makes sense in many ways—but we’ll have to see who latches on.